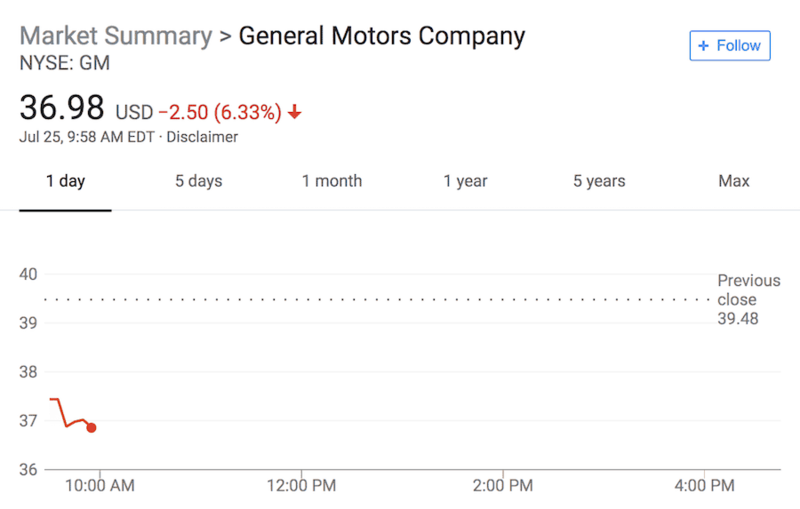 General Motors has lowered its 2018 earnings forecast by around $1 billion, sending its stock down by 6.33% at the time of this article. The company cites a massive increase in the cost of steel and aluminum caused by Donald Trump’s tariff policies that have started a global trade war. GM will partially offset the higher commodity costs but expect to experience a net impact of $1 billion for its full-year results. The $1 billion net loss is double what the company originally expected to lose. While General Motors purchases most of its steel from U.S. producers, those companies have raised their prices in response to tariffs levied against their international competitors. The automaker buys most of its steel from U.S. producers, who have raised prices in reaction to tariffs on imported steel imposed by the Donald Trump administration earlier this year. The company also faces headwinds in regards to international sales. Worldwide vehicles sales fell 12 percent in the three months ending in June to 2.06 million, the lowest numbers since Q3 2010. GM has lowered its earnings forecast to $6 per share, down from $6.30 to $6.60.